Looked long and hard for this high quality, correct boat lift color fabric. Top notch coated polyester, tight woven and price conscious. 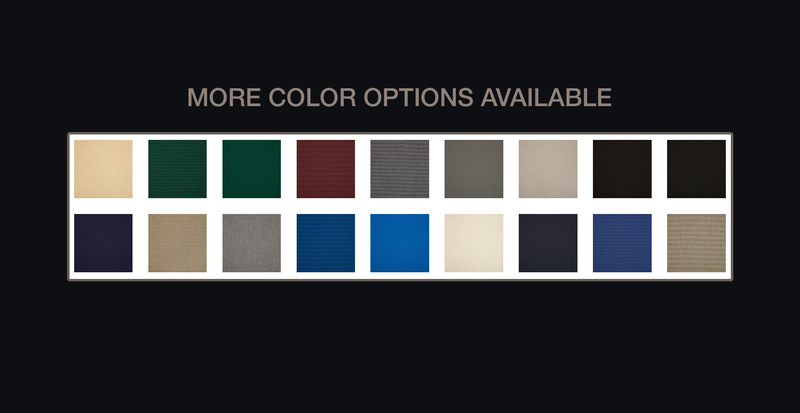 All colors are one shade darker across the board then Shelter-Rite colors and high tear resistance. Genuine “Sunbrella” outer side, and flipped over with top notch under vinyl backing. Visually drop-dead gorgeous and superior long lasting life. Sunbrella is the premier woven, acrylic fiber, and Hartz textered vinyl underneath. Produces a Lexus looking, rich, color fast, water proof awesome fabric. Very waterproof, high abrasive resistance, high UV, colorfast, easy to clean (mild soap and water, lightly scrub brush). This is the “Lexus” of fabrics.